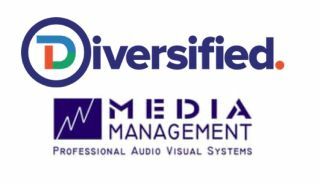 Diversified, a national solutions provider of presentation AV, IT, broadcast, healthcare, and managed services, has acquired Dallas, TX-based Media Management. The company brings a strong reputation, market share, and expertise in corporate AV, healthcare, IT design, and integration services in the Southwest region. Given the unique and diverse requirements of its national enterprise, educational, healthcare, and house of worship clients, local designing, project management expertise, and support is a must. With its existing regional office in Houston, Diversified will now be able to deliver a higher level of support in the Southwest region. As senior vice presidents, McMullan and Dungan will join Diversified executive management to integrate the Media Management team members into Diversified’s operations.